Recipe kits feature fresh, healthy, seasonal produce items. We do the work of testing delicious seasonal recipes, and provide portioned ingredients. You do the cooking and enjoy! A delicious summer salad, perfect for a hot day! 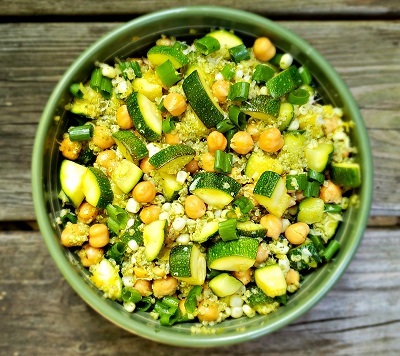 Fresh local zucchini and corn are combined with chickpeas, protein packed quinoa, and a zesty pesto dressing! Finish it all off with a splash of lemon juice, for a balanced, and flavorful dish! Serve it with dinner or on it's own for lunch, the quinoa makes it plenty filling.